with a follower-type output buffer. adds an unwanted voltage equally to both terminals of a sensor? 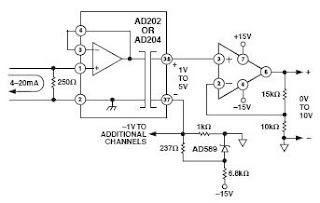 The differential amp reject the noise and rescue the signal. from 0V at 4mA to 5V at the full-scale loop current (20mA). voltage or flag a pre-set loop current. achieving stability is easier when using a CFA. design. Why? The main culprit is the sensor's own capacitance CS.